This is an older image aswell that I never shared for some reason. 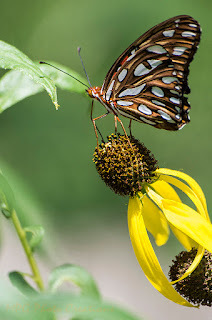 This is a Gulf Fritillary Butterfly that I captured on Grayhead Prairie Coneflower. The cone looks gray after the seeds fall off or are eaten. It is easy to grow from seed.